Smart urban stormwater management means reduced pollution in our waterways and better water quality at our beaches. What can we do to reduce stormwater pollution? Stormwater is rainwater that falls onto roofs, roads, other hard surfaces and parks, and flows into gutters and stormwater drains. This water, including any sediments and contaminants it carries with it, flows through a series of pipes and open channels and eventually into our natural waterways and ocean. 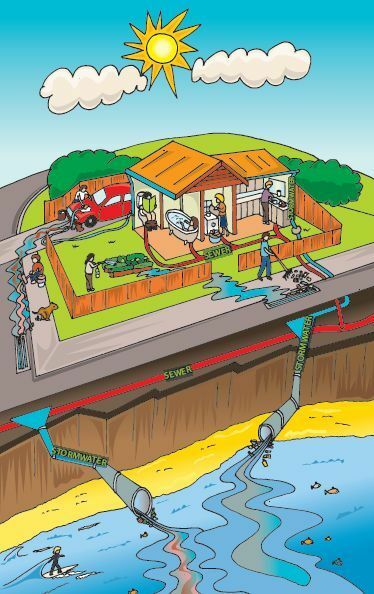 The stormwater system is separate from the sewerage system, and flows along a completely different network of pipes. Around 85 km of stormwater pipe is owned by Waverley Council and 5.8 km of pipe is owned by Sydney Water. Unlike sewerage, stormwater is not treated. However, in some cases, stormwater can be harvested, treated and used for non-drinking purposes. Pollution in our natural waterways affects the public health of people swimming, marine life and aquatic habitat. High bacterial levels pose a health risk to people who play or swim in the water. Stormwater may carry high concentrations of pollutants after a big rainfall event, so it's not recommended to swim immediately afterwards. High sediment or soil content reduces light penetration affecting growth of aquatic plants and can suffocate fish by clogging their gills. Garden clippings and leaf litter that decays in water uses up oxygen, taking vital oxygen away from marine animals. Litter that clogs waterways can be toxic as it breaks down in the water, or it may be mistaken as food and ingested by animals. When using oil-based paint dispose of it at Chemical Cleanout. Rinse water-based paint in sink or at the very least, on a grassed area. Small amounts of dried paint in cans can be disposed of in regular rubbish bins. Sweep gutters and driveways rather than hose them down. Put leaves and grass clippings in the compost or on the garden as mulch. Wash your car on grass and use as little detergent as possible, pouring leftover soapy water into lawn. Use service station car washing bay or car wash. Check your car regularly for leaks and get them repaired. scoop your dog's poo in the yard and in all public spaces. tie a bag onto lease so that you always have one ready. dispose of used bag in rubbish bin. Put cigarette butts in waste bins or hold onto them until you find a bin. Help clean up littered areas. If no bins are available, hold onto your waste until you find one. Ensure fertiliser pellets that make their way onto the footpath are swept up rather than hosed down the drain. You can install rainwater tanks next to your home to reuse collected rainwater in your garden or for toilet flushing. On a larger scale, stormwater pipes or channels that drain to a common point can be harvested and reused to irrigate public parks and used for public toilets. Learn more about the stormwater harvesting projects Council has been running in Waverley.